Salem scored a run each in the third, fourth and fifth innings, but Lynchburg's five-run third and four-run fifth were too much for the visitors to overcome. Ryan Fitzgerald delivered one of the few offensive highlights, notching two hits, including a triple, and an RBI. Pedro Castellanos had the other RBI. Jhonathan Diaz allowed five runs on six hits in 2 2/3 innings of work, walking four. His replacement, Devon Fisher, did not fare much better, matching Diaz' four free passes in 1 2/3 innings. Fisher also surrendered four runs on five hits. Greenville held a 5-3 lead after two frames, but Augusta was productive throughout the middle innings to take an 8-5 lead headed to the bottom of the fifth. The Drive, who notched 11 hits. Triston Casas' first professional home run was part of a two-run seventh to re-tie proceedings, but Miguel Suero surrendered the go-ahead run in the eighth. Greenville got the tying run to second base in the ninth, but could not push Casas, who walked, across the plate. 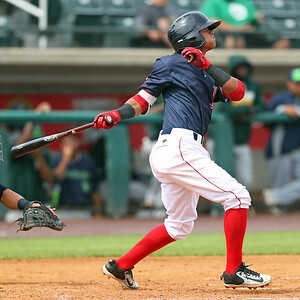 Kervin Suarez (pictured) led the way offensively with a 3 for 5 performance with two doubles and three RBI. Hunter Haworth had a rough day on the mound, allowing seven runs on nine hits in four innings of work. He struck out two and walked two. Player of the Night: It was slim pickings with only two games on the day, but Kervin Suarez gets the nod with a three-hit performance. The 20-year-old added three RBI, after heading into tonight's game with the same amount on the young season. Suarez also increased his double total two-fold to four. He is on his second year in Greenville and looks to improve upon his .234/.282/.340 line from 2018.